South Dakota is a ranching state. The state’s economy relies mainly on tourism, agriculture and defense spending. Mount Rushmore is the state’s most-visited tourist destination. CNBC’s list of “Top States for Business in 2010” has recognized this state as the 7th best state in the nation for business activity. When incorporating in the USA, foreign entrepreneurs should feel confident knowing that their personal assets are protected. Corporations and limited liability companies separate the assets and liabilities of companies from the personal assets of the business owner. South Dakota requires that C corporations and LLC not have a name that is the same or could be confused with a business already in existence. To make sure your business name is eligible Inc. Plan can help you choose a unique C-Corp or LLC name. A distinctive corporate name enhances your company’s reputation and also helps protect the identity of your brand. South Dakota is one of the most tax-friendly states for businesses. Corporate taxes are imposed only on banks and financial institutions. South Dakota charges no personal income tax to residents. South Dakota does not have any residency requirements. Owners and directors do not need to live in state to legally operate a South Dakota company. Before your firm is legally eligible to operate make sure you possess all the required business licenses, permits, and tax registrations. Inc. Plan can help you stay in compliance with state law. C-corps and LLCs in South Dakota are required to have at least one member. There are no age restrictions on owning a company. The names and addresses of members and owners of LLCs are not required to appear in the initial filing documents. However, if an LLC is managed by managers, then they must appear in the incorporation documents. LLC names are allowed to end with the terms “Limited Liability Company” or the abbreviations “LLC” and “L.L.C..” The words “Bank,” “Insurance” or any variation of those terms needs special approval from the state to be included in the incorporation name. Names must be unique and distinctive from the names of any other business, unless a written consent is obtained. Entrepreneurs looking to form LLCs in South Dakota must file Articles of Organization with the state. South Dakota-based LLCs are required to submit an annual report due before the second month following the anniversary incorporation month. The fee for filing an annual report is $50. The Articles of Organization must include the name and address of a registered agent who resides in South Dakota and who is available to manage legal and tax business documentation. For more help with the initial corporate filing or with finding registered agent services feel free to contact Inc. Plan (USA). Unless they are banks or conduct any financial activity LLCs are not subjected to a corporate income tax. Banks and financial institutions are imposed income taxes with rates ranging from 0.25% to 6%, depending on their income. 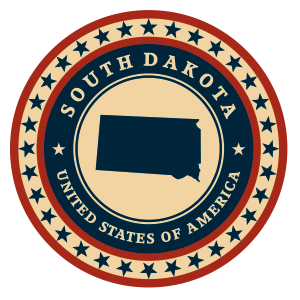 The organization name designations allowed in South Dakota can include the terms “Company”, “Corporation,” “Incorporated” or “Limited,” along with their abbreviations. The words “Bank”, “Insurance” or any variation of them need special approval from the state to be allowed in the incorporation name. The incorporation name must be unique and distinctive from the names of any other business, unless a written consent is obtained from the current user. Entrepreneurs looking to start a business in South Dakota must file Articles of Incorporation with the state. Businesses are required to file an annual report due in the company’s incorporation month anniversary. The fee for filing an annual report is $50. The Articles of Incorporation require a listing of the company’s authorized shares and par value, as well as the name and address of a registered agent with a physical South Dakota address. The capital structure does not affect the initial fees. Inc. Plan (USA) can help you with the necessary filings and also with qualified registered agent service. Unless, they are banks or conduct any financial activity, C-Corps are not subjected to a corporate income tax. Banks and financial institutions are imposed income taxes with rates that range from 0.25% to 6%, depending on their net income.